As the nights draw in, mornings become darker and the air is fresher, we all naturally begin to crave our favourite comforts foods. Reaching for the satisfying winter warmers might seem an unhealthy more calorific option to many but by simply swapping some of the ingredients in your recipes, you don’t have to sacrifice gorging on the foods you love most. We carried out a survey of 2000 adults that found 80% of Brits resort to their favourite meals for comfort – as do we! The top five from the survey included the traditional full English breakfast, fish and chips, pizza, a bacon sandwich and a burger. In a recent article from the online lifestyle magazine About My Generation, they share a few ways to help make the nations dishes a little bit healthier. For example, they suggest swapping fried bacon for grilled, fried eggs for poached (Clarence Court for a golden touch), and fried bread for wholemeal toast. Beans and grilled tomatoes add to your recommended 5-a-day too. 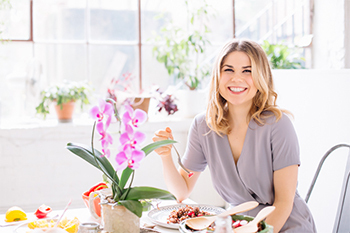 Nutritionist and Clarence Court ambassador Madeleine Shaw has a fabulous recipe for a full English with a healthy twist. Featuring portobello mushrooms, sweet potato and homemade baked beans it makes a delicious breakfast feast. You can follow the full recipe here.